Abbreviation for antineutrophil cytoplasmic antibodies , under antibody. abbreviation for antineutrophil cytoplasmic antibody. One of two (or three, if including x-ANCA) different IgG antibodies seen in patients with autoimmune diseases and ANCA-related vasculidites. ▪ c-ANCA (Cytoplasmic) (classic)—Autoantibodies against proteinase 3; diffuse cytoplasmic staining; seen in Wegener’s granulomatosis. ▪ p-ANCA (Protoplasmic)—Autoantibodies against myeoperoxidase; perinuclear staining; seen in ulcerative colitis, Churg-Strauss syndrome, primary sclerosing cholangitis, polyarteritis nodosa (microscopic polyangiitis variant), focal necrotising and crescentic glomerulonephritis, rheumatoid arthritis. Antibodies neutralize or destroy antigens in several ways. They can initiate lysis of the antigen by activating the complement system; neutralize toxins released by bacteria, coating (opsonizing) the antigen or forming a complex to stimulate phagocytosis; promote antigen clumping (agglutination); or prevent the antigen from adhering to host cells. An antibody molecule consists of four polypeptide chains (two light and two heavy), which are joined by disulfide bonds. The heavy chains form the complement-binding site, and the light and heavy chains form the site that binds the antigen. An autoantibody against acetylcholine receptors in the neuromuscular junction. Binding, blocking, or modulating antibodies against this receptor are found in the blood of most patients with generalized myasthenia gravis and in about half of all patients with ocular forms of the disease. An antibody that stimulates or activates an organ. E.g., agonistic antibodies against the thyrotropin receptor in Grave disease stimulate the thyroid gland to release thyroid hormones that produce hyperthyroidism. An autoantibody against the cell membrane lipid, diphosphatidyl glycerol. It produces abnormal and sometimes life-threatening blood clotting. The antibody is found in a variety of autoimmune and infectious diseases, including in patients with the antiphospholipid antibody syndrome and syphilis. An antibody found in the serum of patients with rheumatoid arthritis but not in those with other joint or soft tissue diseases. An antibody formed during infection with group A beta-hemolytic streptococci. It is used, retrospectively, to help diagnose recent streptococcal infections. An antibody that cross-reacts with smooth muscle collagen and the gluten in wheat, found in the serum of people with celiac sprue and some related autoimmune diseases. An autoantibody present in the serum of patients with a variety of autoimmune diseases, including scleroderma (systemic sclerosis), systemic lupus erythematosus, interstitial lung diseases, and sarcoidosis. They attach to antigens on the cells that line blood vessels and injure those cells, producing blood vessel injury and inflammation (vasculitis). An autoantibody to the nucleolar protein fibrillarin, found in patients with diffuse systemic sclerosis (scleroderma), esp. those with relatively severe disease. It is identified more often in men than in women with the disease and in people of African descent as opposed to Europeans or Asians. An antibody formed against the chemical components of nerves, found in the serum of those with Guillain-Barré syndrome. An antibody formed against the gluten in wheat, found in the serum of people with celiac sprue. Any antibody found in plasma that, when donated and infused into a recipient, damages the recipient's white blood cells. Leukocyte injury after plasma exchange or infusion is the event that triggers transfusion-related acute lung injury. An autoantibody associated with paraneoplastic encephalomyelitis. It is also known as ANNA-1 (antineuronal nuclear antibody-1). An autoantibody found in the plasma of patients with thyroid injury, e.g., in several forms of thyroiditis and other rheumatologic or autoimmune diseases. An antibody found in patients with several autoimmune vasculitides, such as microscopic polyangitis. Any of several antibodies that bind to neuronal targets in the cerebrum and cerebellum, producing paraneoplastic neurological dysfunction. The antibodies are typically released by cancers such as small-cell carcinoma of the lung (also known as ANNA-1 and ANNA-2), testicular cancer (anti-Ta antibody), or breast cancer (ANNA-2). An autoantibody found in the blood of patients with certain forms of vasculitis (such as Churg-Strauss syndrome, microscopic polyangiitis, Wegener granulomatosis) esp. when it affects small blood vessels. Any of a group of autoantibodies that react against normal components of the cell nucleus. These antibodies are present in a variety of immunologic diseases, including systemic lupus erythematosus, progressive systemic sclerosis, Sjögren syndrome, scleroderma, polymyositis, and dermatomyositis, and in some patients taking hydralazine, procainamide, or isoniazid. In addition, ANA is present in some normal people. Tests for ANAs are used in the diagnosis and management of autoimmune diseases. Any of a group of immunoglobulin autoantibodies that react with phospholipids, which are one of the primary components of the cell membrane (the other components are glycolipids and steroids). These antibodies are found in patients with a variety of connective tissue and infectious disorders, including systemic lupus erythematosus, the antiphospholipid antibody syndrome, syphilis, and malaria. They cause abnormal blood clotting, thrombocytopenia; and in women of childbearing age, repeated miscarriages. The anticardiolipin antibodies are one type of antiphospholipid antibody. An antibody found in the blood of patients with diseases in which cells replicate rapidly. Such conditions include autoimmune and inflammatory diseases and malignancies. An autoantibody found in patients with small blood vessel vasculitides, such as Wegener granulomatosis. An antibody that reacts with the antigen receptor on a cell rather than with an antigen itself. An autoantibody found in patients with systemic lupus erythematosus, esp. those with neurological or psychiatric manifestations of the disorder. A serum marker of autoimmune thyroid destruction, i.e., of Grave disease or Hashimotothyroiditis. An antibody that reacts with striated muscle cells. It is found principally in people with myasthenia gravis who also have thymoma. An autoantibody found in the serum of patients with progressive systemic sclerosis, silicosis, and systemic lupus erythematosus. Higher levels of the antibody correlate with worsening kidney, lung, and skin disease. An antibody that prevents an antigen from binding with a cellular receptor. 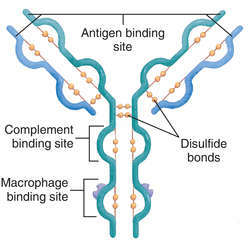 An antibody that reacts with antigens other than its specific antigen because they contain binding sites that are structurally similar to its specific antigen. An antibody that lyses cells by binding to a cellular antigen and activating complement or killer cells. A fluorescent antibody test performed on sputum to detect microorganisms that invade the respiratory tract, e.g., Legionella, Mycoplasma, or Bacillus anthracis. An antibody that has been stained or marked by a fluorescent material. The fluorescent antibody technique permits rapid diagnosis of various infections. An antibody to glutamic acid decarboxylase. It is a serum marker of type 1 diabetes mellitus and is found in the blood of patients with stiff-person syndrome. An antibody produced by immunization or as a result of transfusion of incompatible blood. An antibody produced by the mother and transferred to the fetus in utero or during breastfeeding. A type of antibody, specific to a certain antigen, created in the laboratory from hybridoma cells. Because monoclonal antibodies are derived from a single cell line and raised against a single antigen, they are highly specific. Diagnostically, they are used to identify microorganisms, white blood cells, hormones, and tumor antigens. In patient care, they are used to treat transplant rejection, certain cancers, and autoimmune diseases. Hybridoma cells, used to produce monoclonal antibodies, are formed by the fusion of a spleen cell from a mouse immunized with an antigen and a multiple myeloma cell (a cancerous plasma B cell). The fused cells are screened to identify those that secrete antibodies against a specific antigen. A continuous supply of these antigen-specific monoclonal antibody secreting cells can then be grown in cultures. An antibody present in a person without known exposure to the specific antigen, such as an anti-A antibody in a person with B blood type. A measure of an organ transplant recipient's level of sensitization to antigens on donated organs. It is the percentage of cells taken from a broad selection of blood donors against whose antigens the organ recipient's serum reacts. The higher the panel reactive antibody, the more challenging it is to match a donor organ to the recipient. An antibody that reacts with many different antigens. A monoclonal antibody to which a radioisotope has been attached. The antibody attaches to receptors on the surface of undesired cells (e.g., cancer cells) and delivers a dose of radiation directly to those cells, leaving healthy cells and tissues relatively unaffected. A monoclonal antibody to which a cell-killing drug has been attached. The antibody combines preferentially with receptors on undesired cells (such as cancer cells) and delivers its lethal drug to those cells but not to healthy cells and tissues. To increase their effectiveness and decrease immune responses to these cells, genes for antigen binding sites from human antibodies are added, creating humanized monoclonal antibodies. Abbrev for Anti Neutrophil Cytoplasmic Antibodies. ANCA specific for proteinase 3 or myeloperoxidase are features of VASCULITIS and WEGENER'S GRANULOMATOSIS. Ninety percent of patients have a positive PR3-ANCA whereas 7% have a positive MPO-ANCA and 3% are negative for ANCA studies. Rajakariar, 'Acute kidney injury with hematuria, a positive ANCA test, and low levels of complement," American Journal of Kidney Diseases, vol. A search through PubMed and Pak Medinet revealed four articles of ANCA associated vasculitis from Pakistan; by two centers, representing only twenty five patients. Histological sampling and ANCA assays should be done at the earliest for a definite diagnosis and early institution of treatment so that irreversible damage to the organ can be prevented. Comparison of anti-GBM antibodies in sera with or without ANCA. In asymptomatic patients the significance of ANCA positivity is not clear but early definitive therapy in the form of radioiodine ablation or surgery should be considered. Because it is known that ANCA may be present in patients with several rheumatic diseases such as RA or systemic lupus erythematosus, it is important to determine the specificity of the ANCA since presence of p-ANCA with antimyeloperoxidase specificity in a patient with polyarthritis is highly suggestive of systemic vasculitis. Aunque la causa de las vasculitis asociadas a ANCA permanece desconocida, diferentes autores reconocen el papel de tales anticuerpos en el desarrollo de estas enfermedades. Testing for ANCA was performed by IF in ethanol fixed neutrophils at initial clinical presentation and was repeated regularly during follow up. ANCA glomerulonephritis is the most common complication of the disease. Burada ozgecmisinde astim, eozinofili ve kardiyak arrest oykusu bulunan ancak makulopapuler ve hemorajik deri lezyonlarindan yola cikilarak tani konulan ANCA negatif CSS'li 28 yasinda bir kadin hastayi sunuyoruz. Army Element, Assembled Chemical Weapons Alternatives (who discussed disposal plans for chemical stockpiles in Colorado and Kentucky); and ANCA and ANCDF (who described Anniston storage and disposal missions, respectively).